On April 12th, a video went viral of two black men being arrested at a Center City Philadelphia Starbucks. The incident has caused an international debate (England, Canada, China) as to just how such a thing could happen. After initially defending the arrests, the Philadelphia Police apologized to the men. Starbucks is even closing thousands of stores to provide racial sensitivity training in response to this one event. The real problem for Starbucks though, along with the Philadelphia Police, is that this was far from just one event; it was a pattern that snowballed into two black men finally saying no when confronted with blatant discrimination. 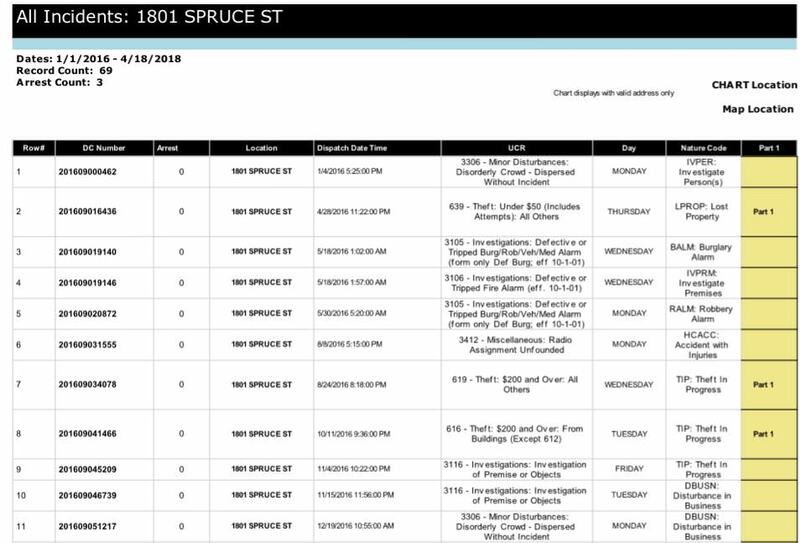 According to public 911 records obtained from the Philadelphia Police, in the year of 2016 only 11 calls were made to 911 from 1801 Spruce Street, 2 of them for a 3306, which stands for “dispersing a crowd.” Something changed though in 2017, which is just about the time it is reported that the new manager, Holly Hylton, started at that location. 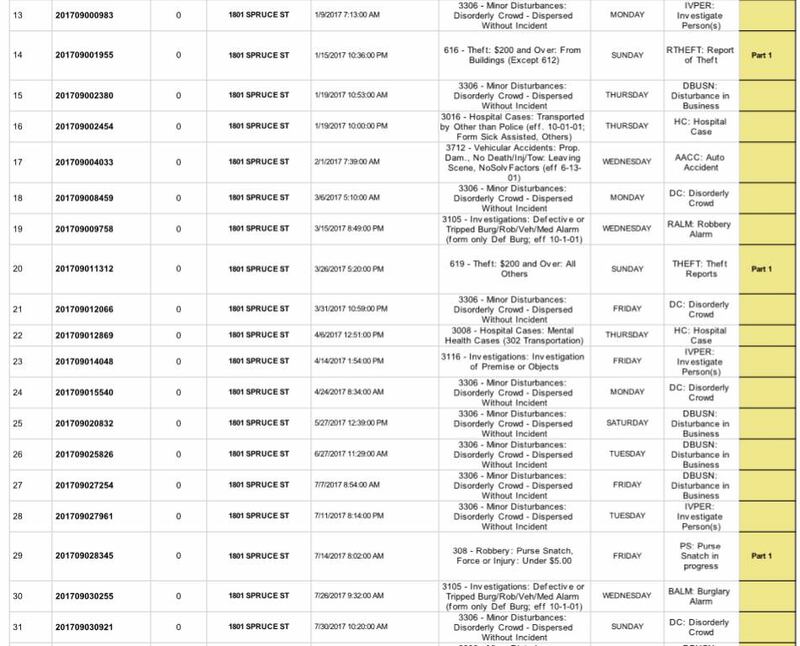 Screenshot of the 911 call data retrieved from the Philadelphia Police. The full request and response are in an appendix at the bottom of this article. 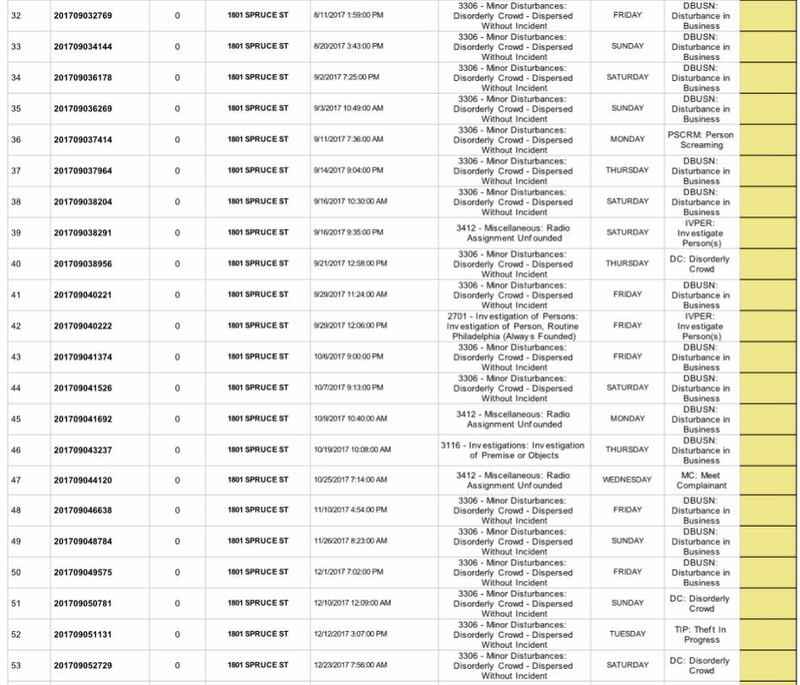 Here is a link to all spreadsheet data imported into Google Sheets, and a link to the original Microsoft Excel spreadsheet received from the police. 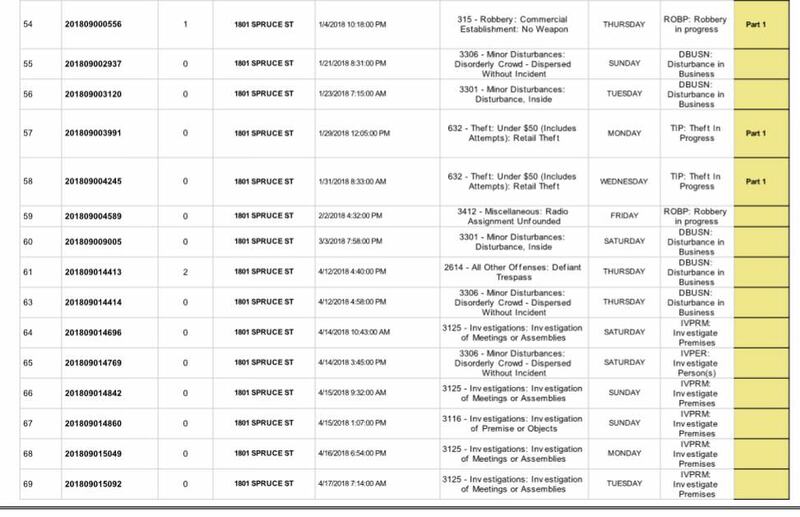 In 2017 at least 28 calls were made for the same 3306 code, with 12 other calls being made for similar minor offenses. Two of these calls were determined to be “unfounded” by the police (that is, unworthy of pursuing), according to the 911 reports. In the first three and a half months of 2018, another 15 calls were made from that same Starbucks, with at least 3 being made for the same 3306 call, and one code being changed for the 2 men arrested. In the entire year of 2018 up till April 18th, four 3306 calls were made to 911, with two of those calls being made on 4-12-2018, the day the two men were arrested – once immediately before they were arrested, and another 18 minutes later. A total of 58 calls to 911 were made to this property in just 15 and a half months, with a total of 3 arrests. This includes the 2 men who were arrested for “waiting while black” that were never charged. This means that there may be dozens of more people who possibly were victims of the same type of police-justified discrimination at just this one Starbucks location. The Rittenhouse Square section where this Starbucks is located has only a 3% African American population, yet African Americans accounted for 67% of all police stops in the same section in just the first half of 2017, according to the ACLU. In fact, two thirds of all arrests in entire city of Philadelphia were of African Americans, despite being less than half its population. While we understand your concern, as we have shared previously, we consider your claim having been investigated and now a closed matter. 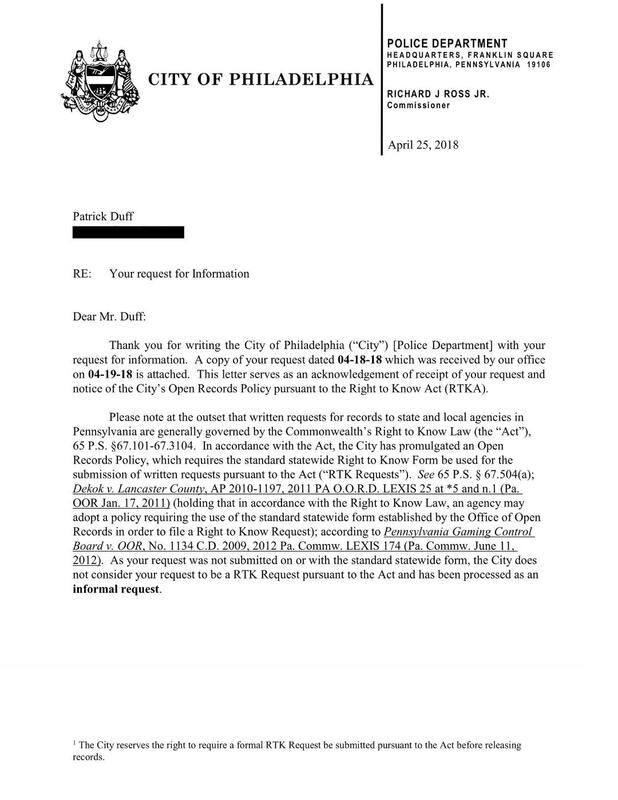 I am making this request under the PA right to know law. 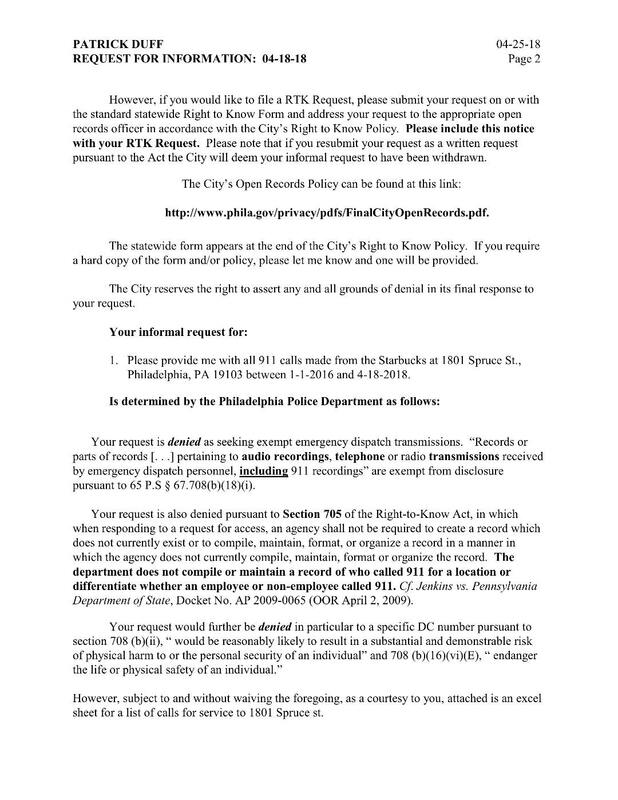 Please provide me with all 911 calls made from the Starbucks at 1801 Spruce St, Philadelphia, PA 19103 between 1-1-2016 and 4-18-2018. 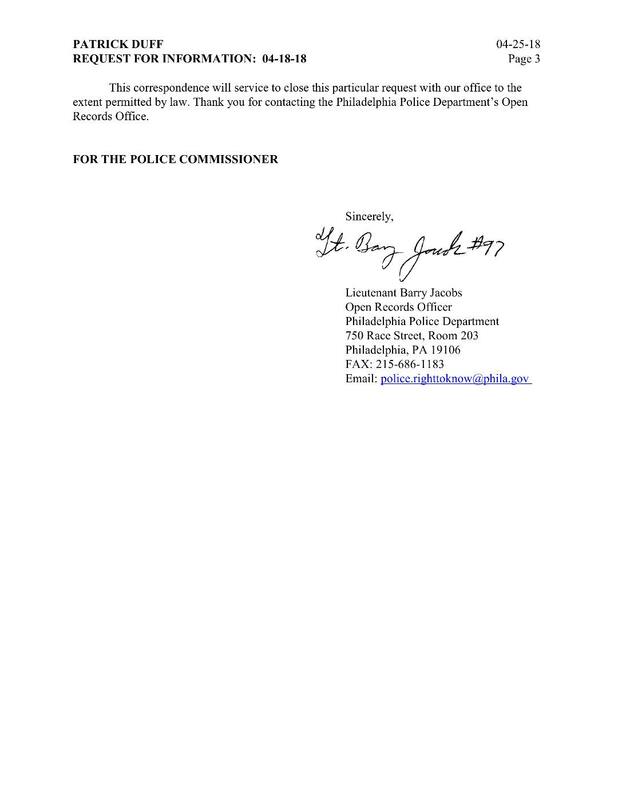 Attached to this correspondence is the Philadelphia Police Department's final determination to your request for information. Previous Post: The FJG is not just “better” than UBI, it’s the only reasonable option. The UBI is sinister. Next Post: OPINION: It is certainly time for change in NJ CD 3!